Greetings for the New Year! I’m just getting back to the MisAdventures project after our busy Holiday season. Since I have a real job and have a retail business, it’s taken awhile to get back over here and get to work. I hope everyone made a NewYear’s resolution – and you haven’t broken it yet. My resolution is to get moved into this place in 2018 – so fingers crossed that will happen. Now were was I? Oh, yes the header says something about stairs. Yes, that’s it! 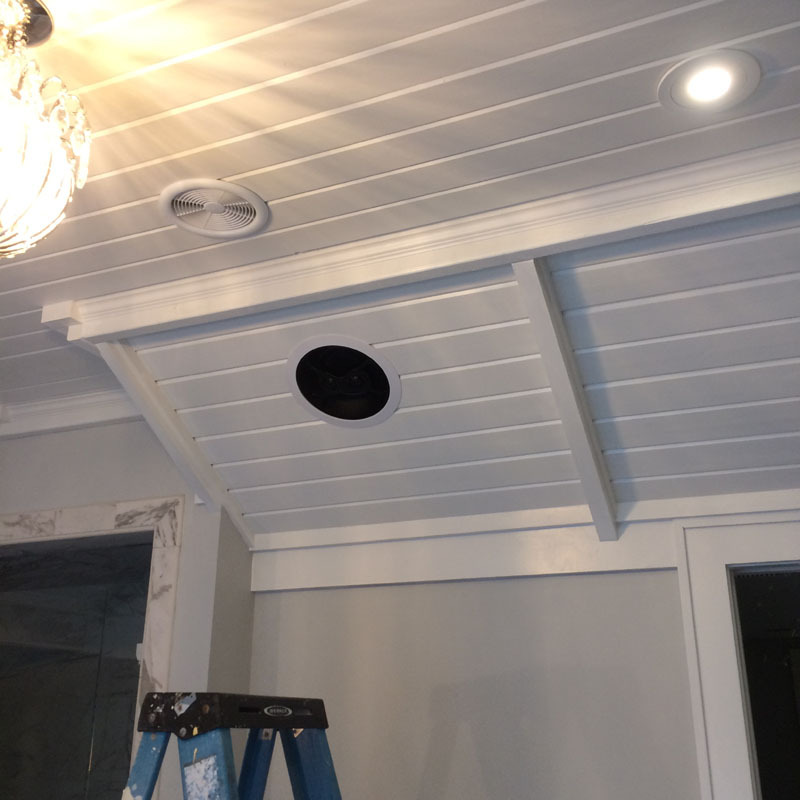 But we’ll start with the master bath and the stereo speaker is added to the ceiling. This will be linked to the Bluetooth AV system so music can be streamed from my wife’s phone while see lounges in the bathroom. 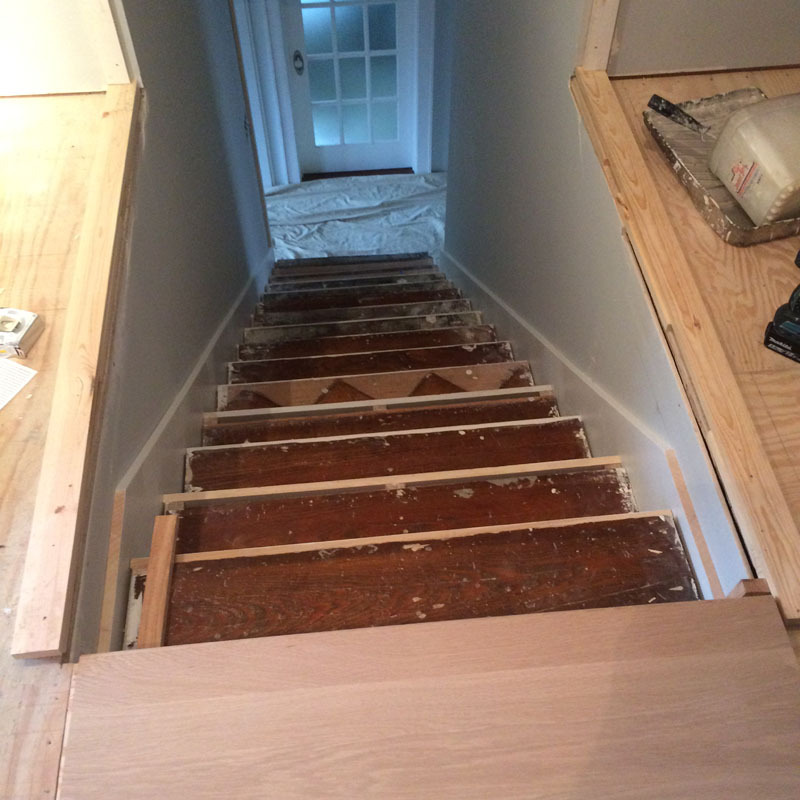 We left the newly constructed staircase like this. 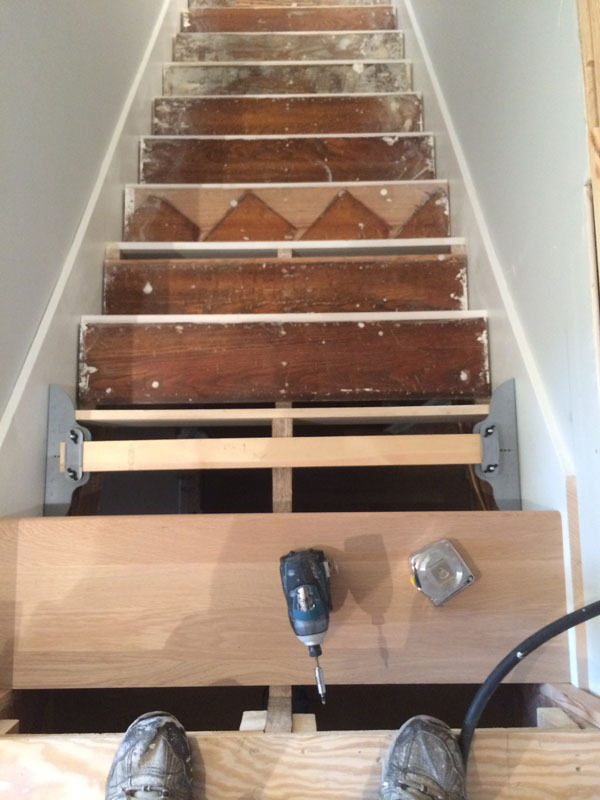 (That was in 2013) I stopped with the addition of the skirt boards on either side and the risers cut and fastened. 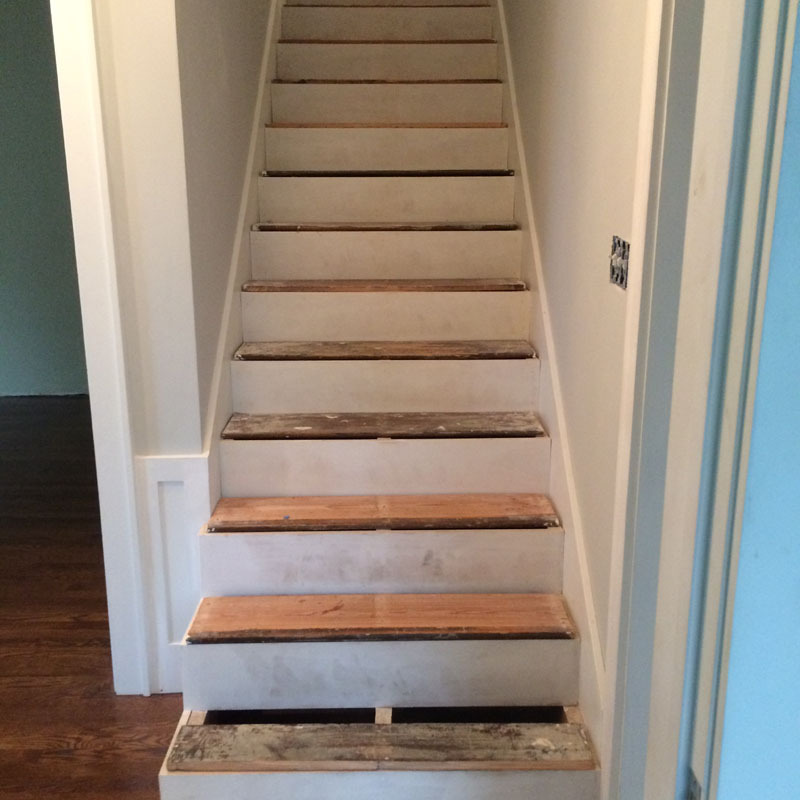 Time for some new stair treads. 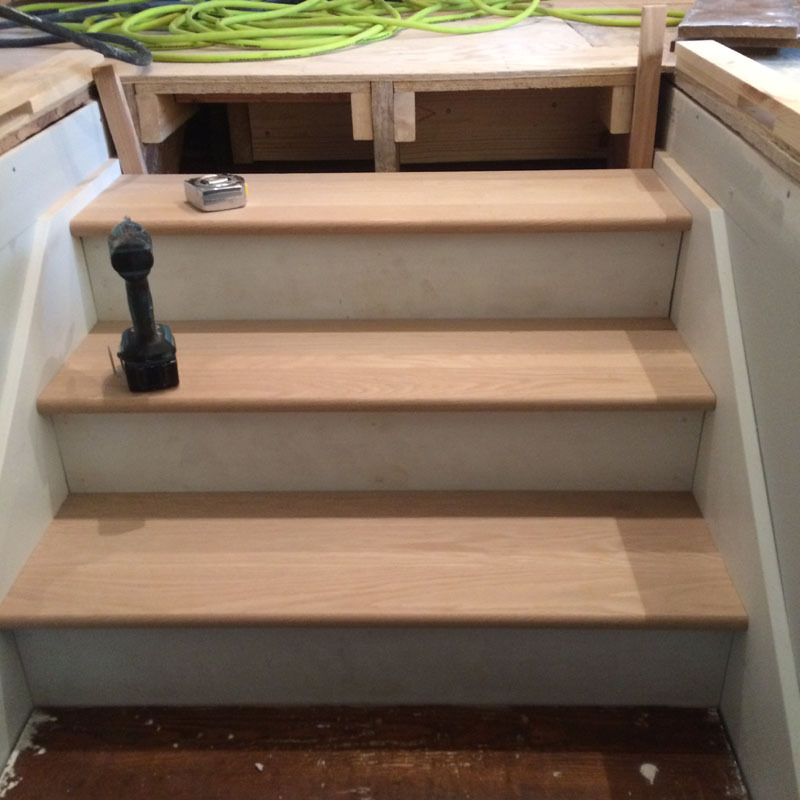 The risers are 3/4″ poplar the three lower steps extend past the left hand wall. 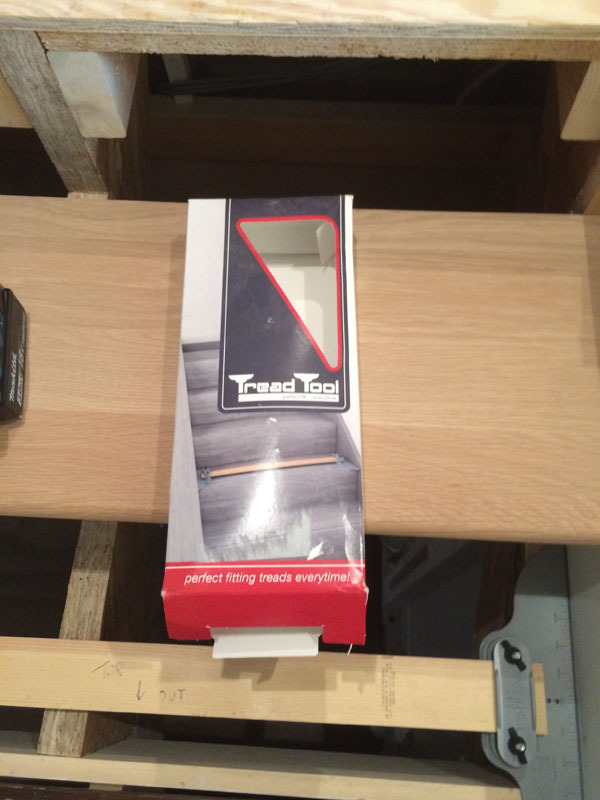 I picked up this tread tool at Home Depot to make measuring the treads more accurate. The tool consists of two plastic end pieces that clamp to a piece of 1X3 lumber. You clamp the end pieces tight against the skirt boards and the riser and you have an accurate template. 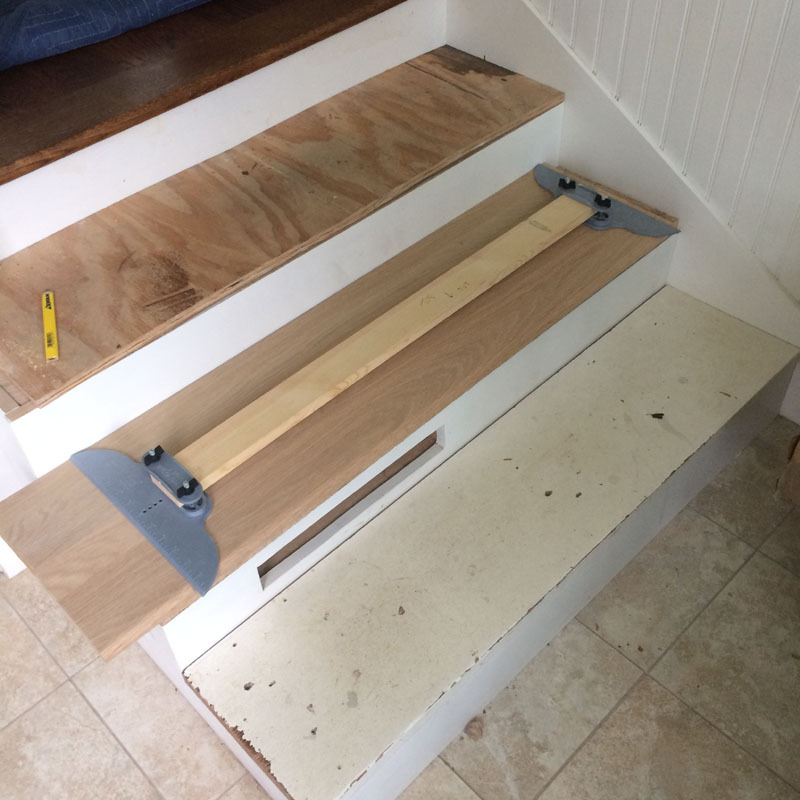 Place the template against the riser (these are the longer ones in the mudroom). Mark the ends of the template and cut. Simple and fool proof. Three cut and 12 more to go. These are only placed in position. 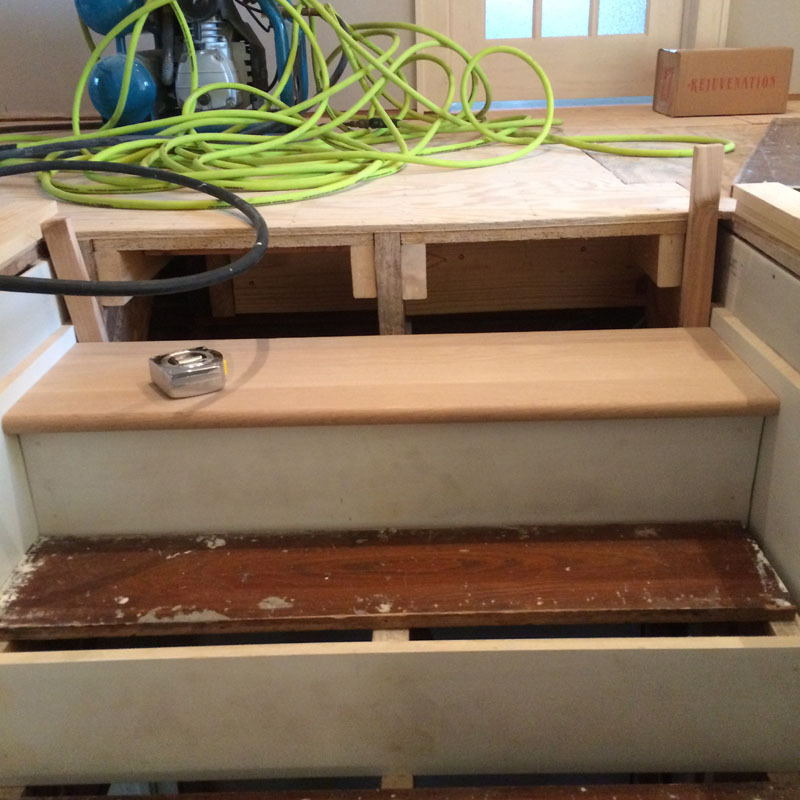 They will be removed and stained by the flooring guys before final installation. I wish I would have had this tool to cut my risers. It would have been more accurate and I wouldn’t have to caulk the riser/skirtboard joint. Live and learn. 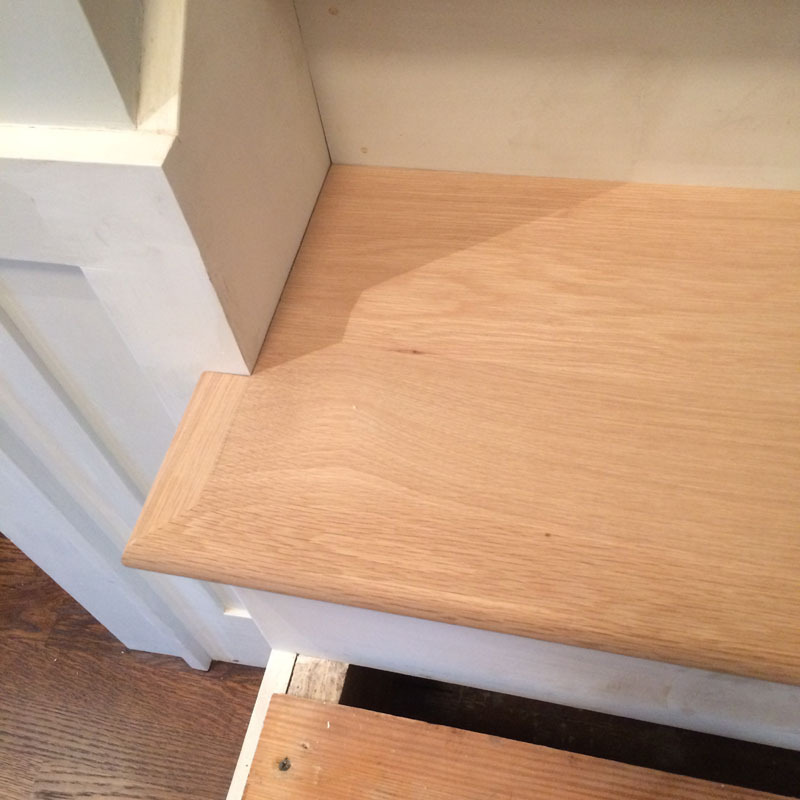 The last three steps require a little more cutting. 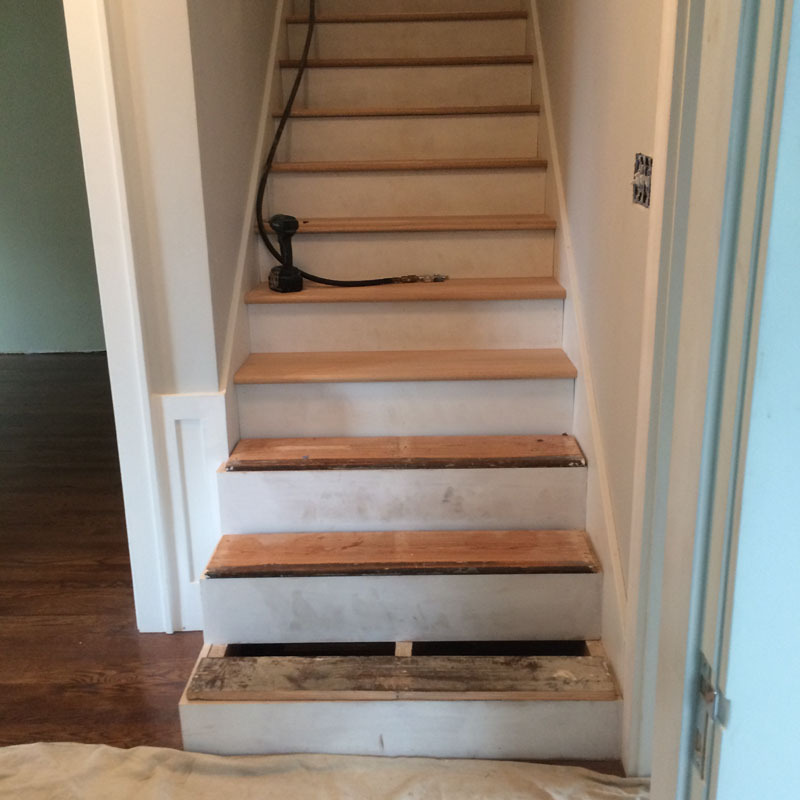 I ordered three treads with left hand returns to fit the exposed end treads. 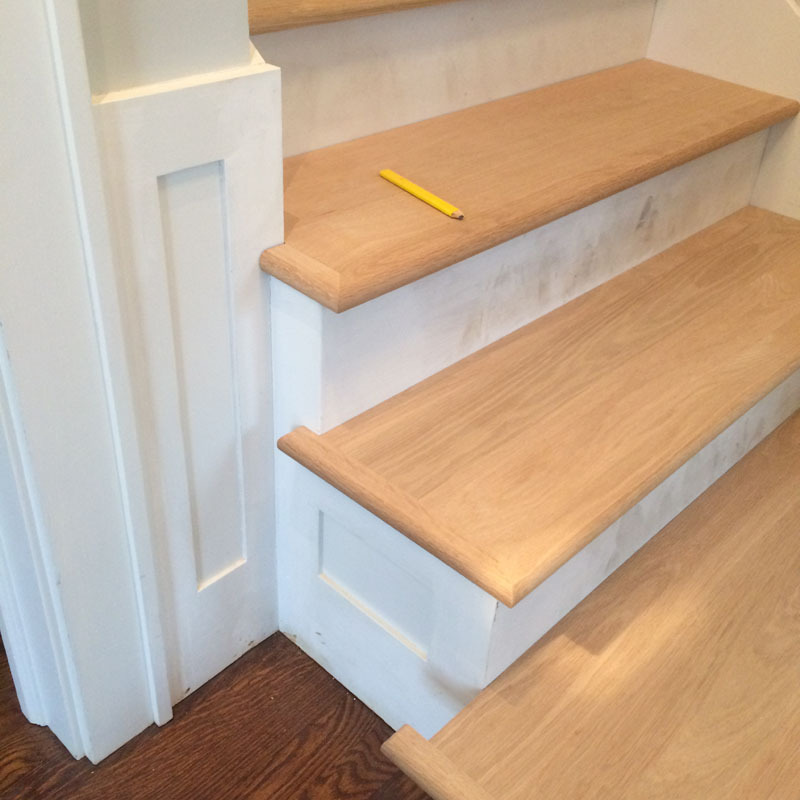 The left hand returns have a finished lip that extends over the side of the stair. This has to be field cut and fitted to the return trim on the wall. The treads are marked and cut to fit. 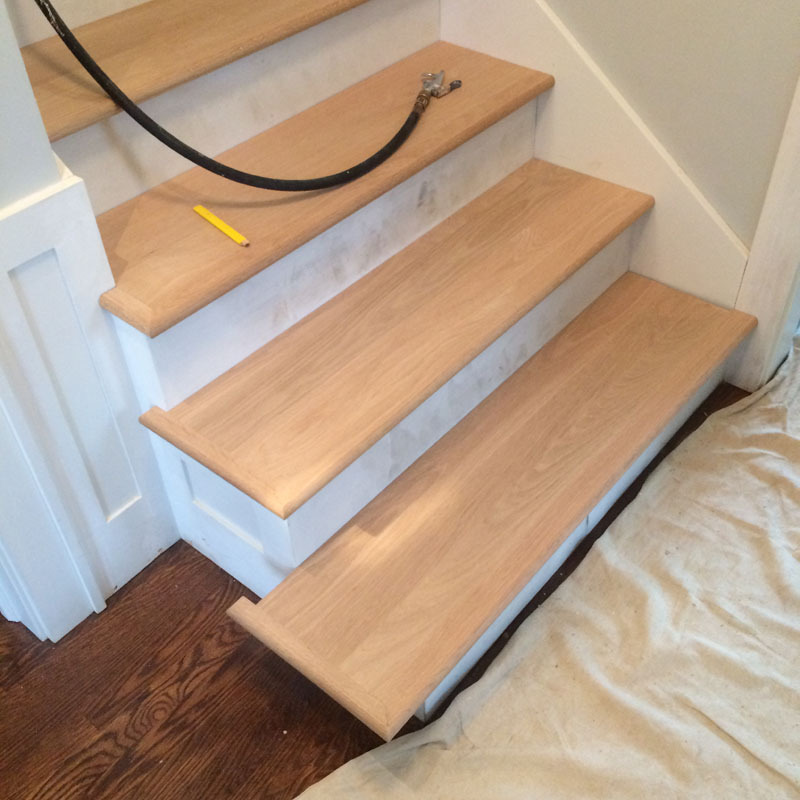 The finish and quality of the treads was very good. So that brings us up to date. Right now we’re in the middle of a snow ‘event’ with temps dropping from 60 degrees this past Wednesday to a -6 coming mid-week. Ah, life in the Midwest.